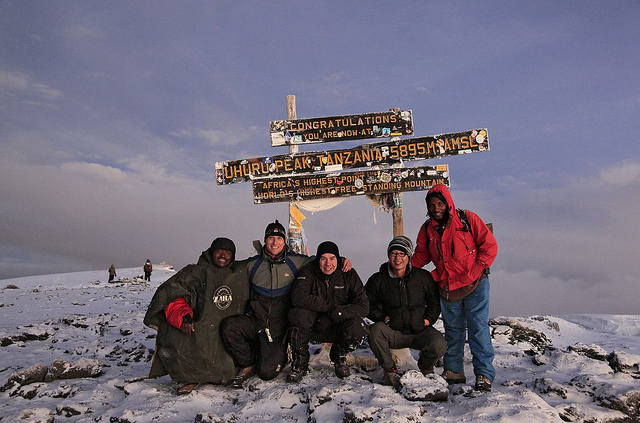 I finally summited Kilimanjaro, the highest mountain in Africa, in March 2011, after waiting for 19 years to return to that mountain for a 2nd attempt! Joining me here are our two guides and climbing parterns Charlie Giang and Jason Maehl. Full trip album is on Flickr at www.flickr.com/photos/wildernessphotographs/sets/72157626495726378/. Photo © copyright by Johnathan Ampersand Esper.